Use automated Elevators to move Crates, Rocks and your playing character in Thinkroll mazes. The world around us is a great resource for our kids to learn. Kids nowadays see concepts such as gravity, floating balloon, and hot vs. cold everyday. But, they may not fully understand them when they don’t have a good way to experiment with them. Thinkrolls is a brand new puzzle game from Avokiddo designed for kids ages 3-8 to play and experiment with these concepts. Throughout its 180 levels, kids can learn to create force with momentum, guess which direction bouncing will lead you to, and observe how automated elevators move to take advantage of them. 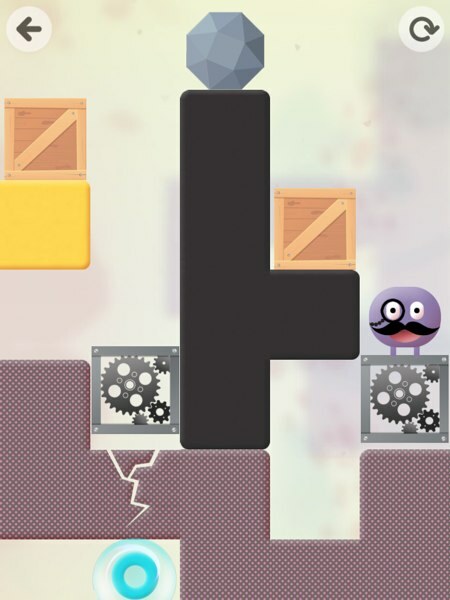 Unlike most platform games, Thinkrolls moves from top to bottom. 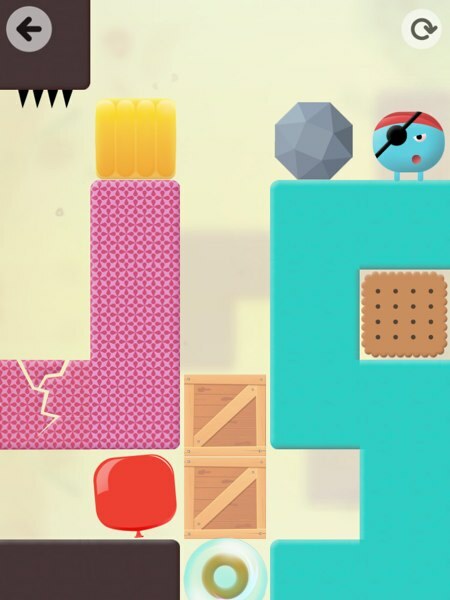 You navigate through a maze using cute characters that can transform themselves into a ball. But your character can only move sideways, and will fall down if you move it to an empty platform. Knowing how gravity works is the key factor to play this game. There are seven chapters, each of which introduces new objects. In the first three chapters, you will learn how to navigate your way with Cookie, Crate, and Balloon. Cookie and Balloon are mostly obstacles that you need to clear. Tap a Cookie repeatedly to clear it, and drag the balloon to a nearby spike to pop it. While Crate can become an obstacle, too, it’s commonly there to help you pad a hole and create a path to your next destination. The next three chapters introduce you to Rock, Jelly, and Fire. If you create a momentum with Rock, you can use it to smash cracked platforms and open a new path. Stepping on a Jelly will bounce you upward, allowing you to move forward even though the pathway is not leveled. But, before you can step on Fire, you need to extinguish it with an Ice block. In the final chapter, you will be playing with Elevator. It moves in an automated pattern, and can connect you to different parts of the maze that are not connected through other means. Here, timing is everything. Learn the movement pattern, and remember that you can also place items such as Crate, Rock, and Jelly on top of an Elevator. There are two difficulty levels available in Thinkrolls, each consisting of 90 mazes. The easy levels are suitable for three-year-olds, whereas the hard levels are challenging enough for kids ages five and up. With both easy and difficult levels, they become more challenging as you progress through the game. Many levels require you to plan your movements ahead, so it’s a great practice for kids to improve their problem solving skills. Thinkrolls supports up to six player profiles, allowing you to define the difficulty level and track progress for each player independently. Thinkrolls supports up to six player profiles with different difficulty levels and playing progress. Once you unlock a level, you can play it directly from the main menu. This allows you to replay a level anytime you like, or ask for help in a challenging level without having to go through all the other mazes. Within each level, there’s also a restart button that you can use to try a different approach when your current approach doesn’t work. One thing I like is that while the levels are to be played independently, there is a sense of continuity when you play. For example, characters will enter the new level in the same position as they exit the previous level. There is fluid movement from one level to the next, allowing kids to play for longer periods of time without having to wait for loading or celebratory screens typically found in other games. Plan ahead your movement: clear the Crates and Balloon from your path, and use Jelly and Rock to your advantage. Thinkrolls is a great game for kids ages 3-8 who love puzzles and mazes. It’s a language-neutral game that contains neither text nor verbal instructions, but is intuitive and fun. As I often say, kids learn best when they play. Thinkrolls is a great way for kids to learn about gravity and other basic science concepts while practicing their problem solving skills and unlocking cute characters such as Frankie, Om, Sira, and Ki.